, a learned and upright judge, was the second son of Robert Rolle of Heanton in Devonshire, where he was born in 1589. In 1606 he entered Exeter college, Oxford, and resided there about two years, after which he was admitted a member of the Inner Temple, Feb. 6, 1608, and studied the law with great perseverance and success. His contemporaries Here were Littleton, Herbert, Gardiner, and Selden, with all whom he formed a lasting friendship. 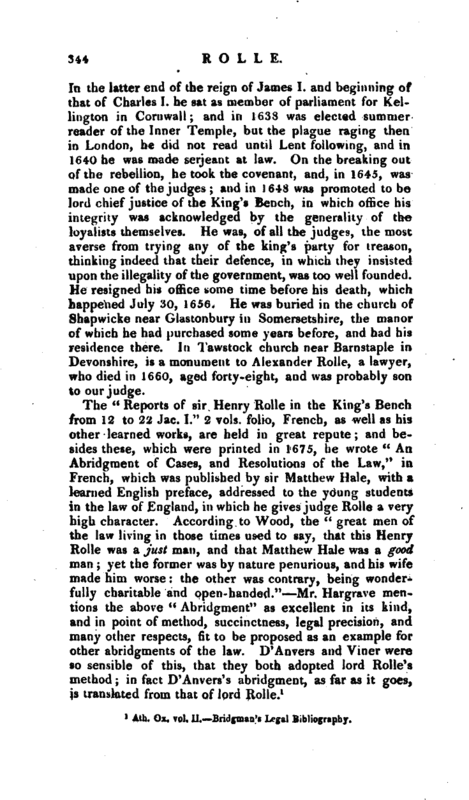 Being admitted to the bar, he practised in the court of King’s Bench, and raised a very high reputation as a sound lawyer. His reading and practice were equally extensive; and he seems to have been formed by nature for patient study, deep penetration, and clearness and solidity of judgment. He soon discovered the hinge upon which every cause turned, and when he was convinced himself, had the art of easily convincing others. | In the latter end of the reign of James I. and beginning of that of Charles I. he sat as member of parliament for Kellington in Cornwall; and in 1638 was elected summer reader of the Inner Temple,but the plague raging then in London, he did not read until Lent following, and in 1640 he was made serjeant at law. On the breaking out of the rebellion, he took the covenant, and, in 1645, was made one of the judges; and in 1648 was promoted to be lord chief justice of the King’s Bench, in which office his integrity was acknowledged by the generality of the loyalists themselves. He was, of all the judges, the most averse from trying any of the king’s party for treason, thinking indeed that their defence, in which they insisted upon the illegality of the government, was too well founded. He resigned his office some time before his death, which happened July 30, 1656. He was buried in the chinch of Shapwicke near Glastonbury in Somersetshire, the manor of which he had purchased some years before, and had his residence there. In Tawstock church near Barnstaple in Devonshire, is a monument to Alexander Rolle, a lawyer, who died in 1660, aged forty-eight, and was probably son to our judge. Ath. Ox, vol. II. 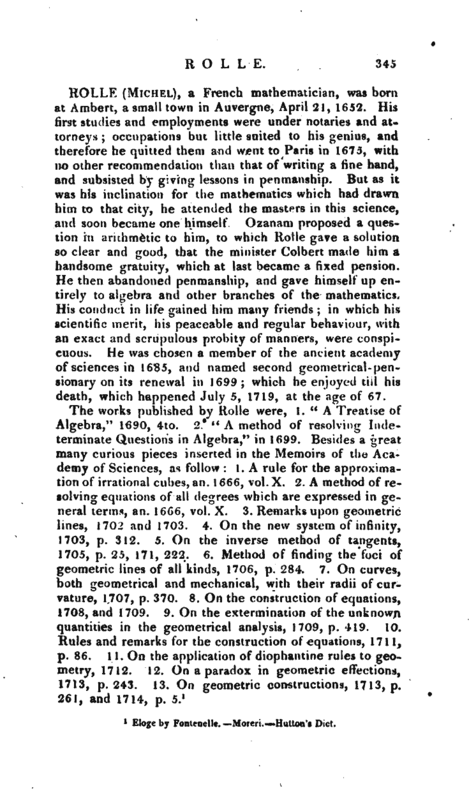 Bridgman’s Legal Bibliography.